This shoe features wonderful hand-painted upper and stitch work and has incorporated stretch material along the vamp to move with you as you walk, providing both comfort and stability. The suede and leather wrapped collar provide additional comfort. The leather lining and the very well padded leather insole provides the ultimate in foot comfort. The sole is constructed with polyurethane and rubber and provides wonderful flexibility and wear. Love these shoes. I wear them almost every day. Sturdy and comfortable. This is my 3rd pair. I am a professional baker who spends Long hours on my feet, and I love these shoes. 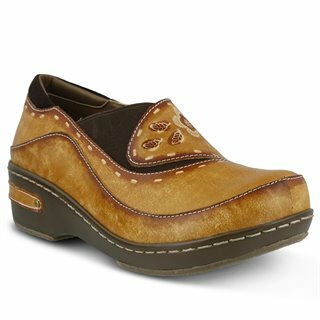 I wore Dansko clogs for about 20 years, and I tried these because of all of the extra padding and I am a convert! Also, get lots of compliments on how cute they are. If you are on your feet a lot- I highly recommend .